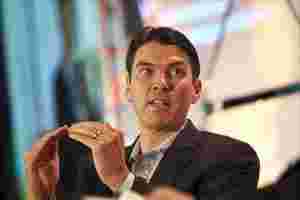 New York: AOL Inc chief executive officer (CEO) Tim Armstrong remains committed to keeping the company independent and is not looking at Yahoo’s assets even as AOL’s larger rivals seek to consolidate. Armstrong said during Reuters’ Global Media Summit on Monday that AOL has not signed a nondisclosure agreement with Yahoo, its much larger competitor that is currently seeking a possible sale of its assets. The former Google executive reiterated the company’s strategy of growing the AOL brand, once known for its dial up services, into a media powerhouse dependent on advertising revenue. In October the news agency quoted sources as saying that Armstrong had been meeting with top shareholders about a possible combination with Yahoo. But Armstrong said that he was only responding to shareholder questions about AOL’s future in the event of a Yahoo sale. “We tried to answer the question to the least of our ability," Armstrong said. AOL would be left out in the cold if Yahoo ended up in the hands of one of its competitors. Microsoft, for instance, is open again to the possibility of a Yahoo takeover after being infamously rebuffed in 2008. Microsoft recently signed a confidentiality agreement to look at Yahoo’s books, according to a source familiar with the matter. Armstrong brushed off those concerns, emphasizing that AOL’s focus is on becoming a top online content destination. “Our strategy has been built in an ‘Art of War’ way," he said referencing the book by the ancient Chinese military general Sun Tzu, beloved by modern executives. Armstrong faces the difficult task of convincing investors, who have sent AOL shares down more than 40% year-to-date, that his strategy is working, however. He argued that the company, once a by-word for online access, has made great strides. Revenue is down only 6% in the third quarter, versus more than 20% in the same period a year ago, while at the same time AOL has been slashing costs. Armstrong repeatedly placed AOL’s performance in the context of the decade-long marriage with Time Warner, roundly criticized as one of the worst mergers in corporate history. AOL was spun off from Time Warner in 2009. The two-year turnaround, which has consisted of several acquisitions, sales, and management restructuring, has made AOL an attractive place for top talent, Armstrong argued despite the recent departures of high-ranking executives like Brad Garlinghouse, head of its Silicon Valley office and Saul Hansell, the former New York Times writer who headed its Seed content platform. “People will continue to see a drumbeat of talent coming to the company," he said. Armstrong also had to cope with the recent departure of Michael Arrington, the founder of TechCrunch. AOL acquired the influential blog a year ago for about $30 million, according to a source at the time. Arrington’s departure hasn’t dented the cache of the technology blog, insisted Armstrong. “TechCrunch, from a valuation standpoint has gone up since we acquired it," Armstrong said. “It’s been very successful both from a traffic and profitability (standpoint). It’s a more successful business than when we bought it a year ago."